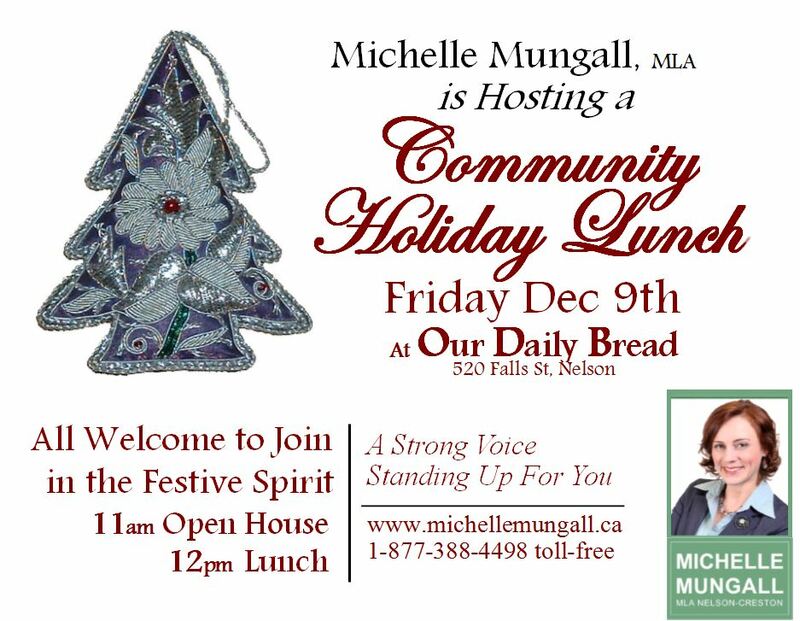 On Friday December 9th, MLA Michelle Mungall is hosting her Annual Community Holiday Lunch at Our Daily Bread in Nelson. This annual event brings people from all walks of life together to share in the Holiday spirit. “The open house starts at 11:00am and I invite everyone in the community to come join me in spreading some joy this season. Lunch is on me!” says Mungall. This year’s Holiday Lunch will also feature a draw to win a fantastic basket full of local Kootenay treats. Drop by Our Daily Bread at 520 Falls Street from 11:00am to 1:00pm to enjoy a beautiful meal, connect with friends, and celebrate the holidays. Our Daily Bread offers a barrier-free lunch program five days a week. It is currently funded by donations from the community, active fundraising campaigns, and through a partnership with S.H.A.R.E. Nelson. For this event, Mungall contributes the cost of lunch for the community.